The Mercury can be focused precisely into your dream bike - from a seriously quick sport touring bike to a middleweight tourer. So this is my "quick sports touring bike" aka my fun Sunday ride. Rohloff IGH with a BB7 disc brake. I prefer the simplicity of V brakes but Thorn say that the light weight seat stays are not capable of accepting braze ons for the V brake pivots so no V brake on the rear. XT V brake on the front which I use for all my braking unless I am making an emergency stop. I have just replaced the original Panaracer Paselas with Schwalbe Marathon Supremes and noticed that the rear wheel with the Rohloff hub is HEAVY but I still believe that if I ever get another bike which is unlikely at my age it won't have derailleur gears. 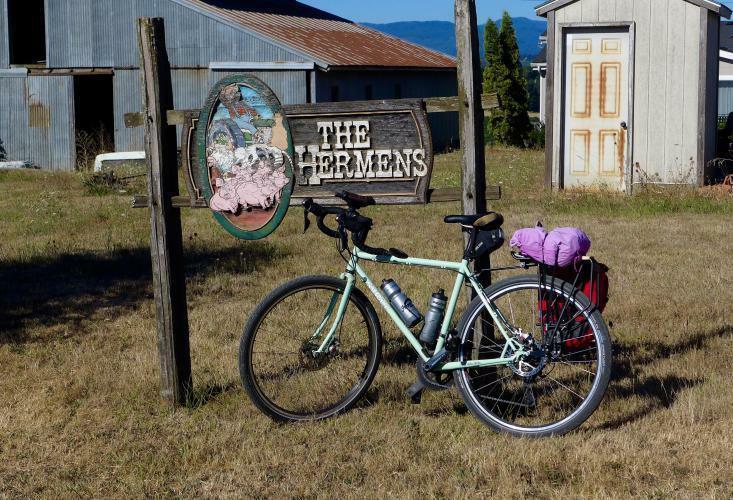 My multi-day touring bike is a 1996 Trek 520 (on the left), that was one of the few years the 520 came with STI shifting - I know it is touring heresy, but I will never go back to separate shift levers. I still use panniers of about the same vintage (REI and Overland) that are pitiful compared to what you can buy today, but hold enough and stay dry. Tires are now Schwalbe Marathons - in the picture I still had an old Continental "inverted tread" tire on the front that just wouldn't die. Most of my tours these days are one or two nighters. Last year I bought a midlife crisis bike (I plan on living to be 120 years old) - a carbon Trek Domane with disc brakes. That is now my road bike for most riding and I've acquired some modern "bike-packing" bags to try it out for 1 or 2 night "credit card style" touring. I've done one way trips carrying change of clothing and food, works out pretty well so far. I only buy new bikes about every 15 years, but I won't go back to rim brakes after riding the disc brake bike. I weigh 230 and making turns at the bottom of hills on the loaded 520 was always an adventure and always required two hands. With the rim brakes, easy peasy - I can signal the turn and still have enough braking power with just the rear brake to slow and stop. I don't ride in the rain a lot on single day rides, but did get caught in a deluge at mile 20 of a recent 60 mile ride - performance in rain is even more impressive. By the way, the 520 is now my Zwift bike over the winter! 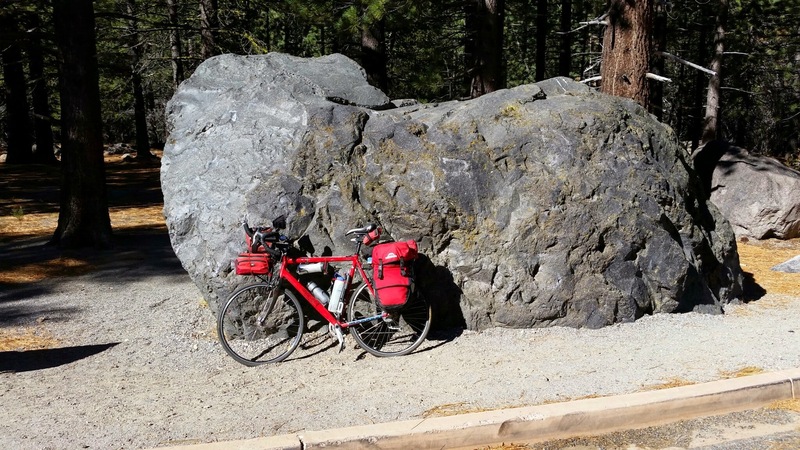 My touring bike is just a plain old Surly Long Haul Trucker. I bought it with stock parts and a few of those parts have since been replaced after many miles of travel. It's starting to look a little rough thanks to it having never been fitted with a kickstand. I lay it down on pavement and gravel, and I lean it up against too many trees, fences, and signs, and I generally don't give it the regular maintenance it deserves. I used to be a little embarrassed about the abrasions, scratches, eroding decals, etc. on the frame, but then a couple of years ago I learned a new word: "Wabi Sabi." It's the Japanese concept of beauty in simplicity, in imperfection, in the natural deterioration of an object. Now I'm kind of proud of my bike's appearance. I've become very attached to my bike and, at this point, I wouldn't trade it for the most up-to-date, custom-built bike with the highest quality and most expensive components on earth. Against all my cynical sensibilities, I even gave my bike a name. I also have a roadie bike and a mountain bike, but The Reckless Mr. Bing Bong is the workhorse and by far my favorite. It is not easy to see from that pic but looks as if you have the dreaded cantis to slow you down. I had a Surly LHT with them and finally upgraded to V brakes which made a huge difference to the stopping power. The Rohloff hub is driven by a 17T sprocket x 36T chain ring, and that lets me spin up long steep hills. Most of the bike is standard Thorn spec--garden-variety Deore V-brakes, for example, with splendid salmon Kool-Stop pads. I use Velo Orange rando bars, nice wide ones; VO alloy fenders, and a mix of VO and Mavic rims with 26 x 1.6" Marathon Supremes. There's a SON 28 dyna-hub at the front, which charges an Anker cache batt, so that I can recharge phone, camera, headlight batts, etc overnight as needed. I use a range of panniers. 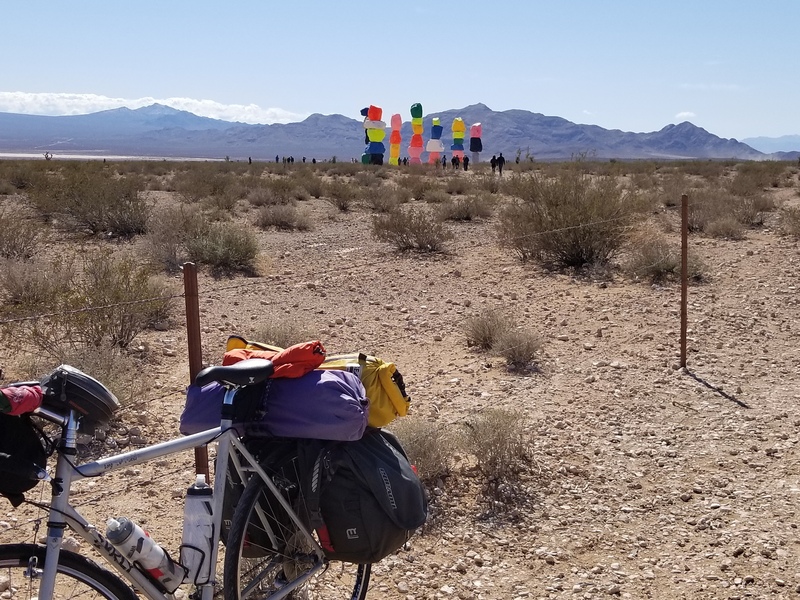 In the photo just below, I have an overnight camping set-up: Arkel Dry-lites on the rear, with a Tangle frame bag and an Axiom handlebar bag. 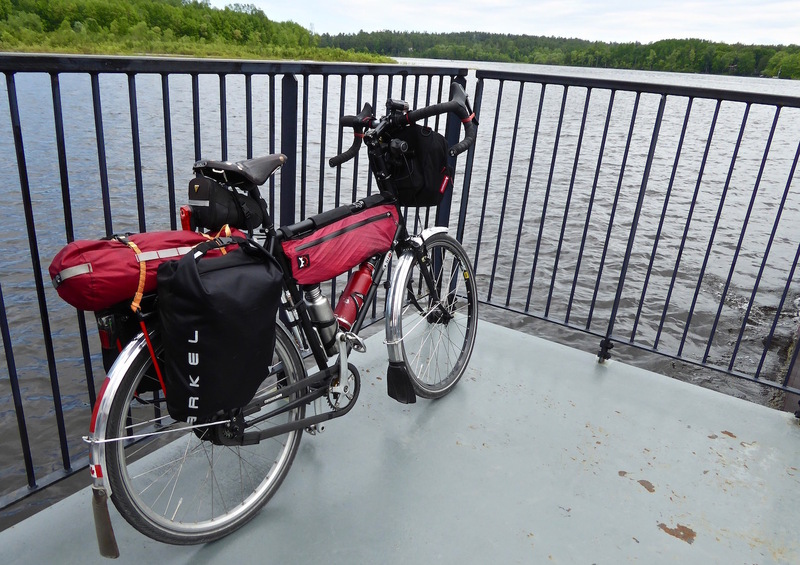 For longer tours, I use Arkel Dolphin waterproofs, Arkel T-28s on the front, and an Arkel h'bar bag, as well as a Tangle frame bag. Osi is a brilliant bike, soooo comfortable, dead reliable, and capable of much more than I could ever ask of it. As a day-ride bike, I have an Eclipse, which I bought in 2003. It's a brand made by Pecco's, a bike shop in Gatineau, just across the river, which sadly just closed its doors. Mine is a ti-framed bike which I used for touring until 2012-13, after which continued derailleur problems drove me into the welcoming arms of the Church of Rohloff. I liked the look of the Eclipse, though, and it was the first really good bike I'd ever owned, so I decided to refresh it rather than part with it. The original carbon forks have been replaced with a nice sturdy Surly steel item, so that I no longer think about collapsing carbon on wretched tarmac in rural Québec. There's a Sora rear der, which so far holds its adjustments; a pair of nice hammered alloy VO fenders, replacing the original uninspiring black plastic; a pair of VO rando bars; and new Avid shorty cantis, which work very well 'cos they have salmon KoolStops too. 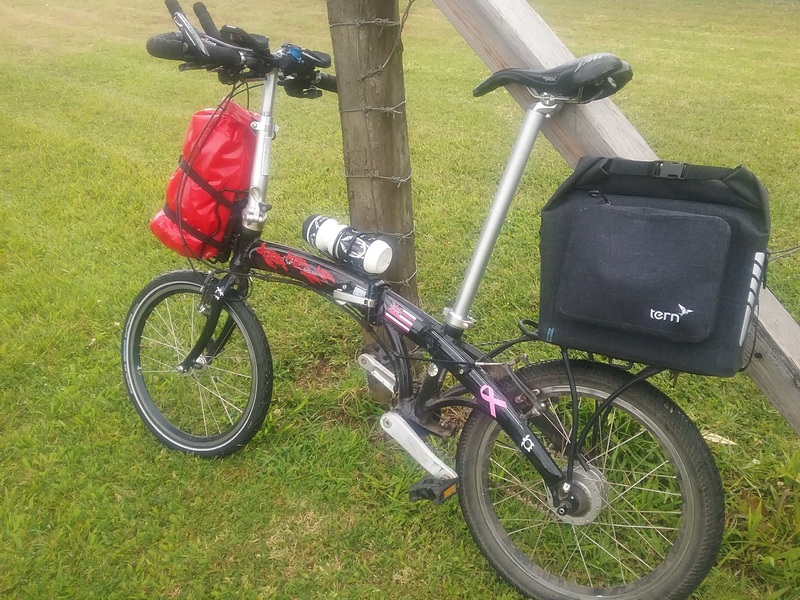 This year I tweaked it some more, installing 700 x 35 Marathon Supremes (which ride on VO "Raid" rims), and lowering the gearing -- it now has a 12 x 34 cassette, and I put on a tiny wee 22T granny gear, the better to handle the hills of the NSW Border Ranges. PS: Welcome, Greg! I trust you're well? I had no qualms about buying a bike from Thorn online as they have an excellent reputation for touring bikes but I ticked the Rohloff box with some apprehension as I had never even seen one but I am happy to advise that I love it. The bike has Shimano XT V brakes running special hard blue pads on the Rigida Andra CSS coated rims and I have never had a problem stopping the bike. The pads are very long lasting.Thorn has an interesting take on the use of the S&S couplers which give a back "half" about the size of a single bike and a short front bit. The couplers enable us to carry the bike on Victorian trains in the space designed for single bikes. Ortlieb panniers as you can see lightly loaded (for us) for credit card touring. We have two pairs: our overseas bikes and our domestiques. When flight is involved, our Bike Fridays always get the nod. They’re new to us this year: we got them down in Eugene in March right before leaving for Greece, replacing our first BF’s which we picked up nine years ago - right after returning from our first tour of Greece, coincidentally. I’m no techie, so I can’t detail them out much. They’re both New World Tourists, with drop bars and disk brakes. Mine is just that bit better than Rachael’s, because I busted the family budget by springing for one of the custom colors. An expense well worth it, I’m sure you’ll agree. Rachael’s camera shy, which is fine here. This is all about the bikes. 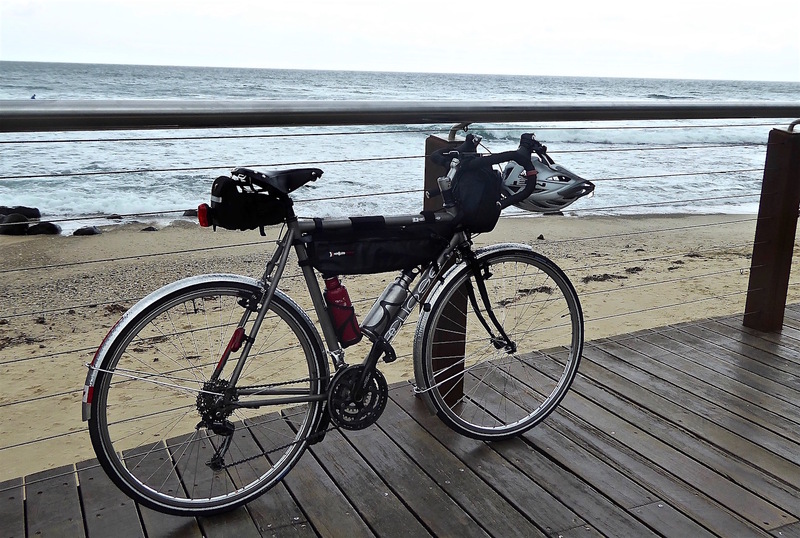 When flight isn’t involved though, we tour on this lovely pair: my beloved Rodriguez and Rachael’s Surley Straggler. They’re both about the same age. Rachael picked up the Straggler in November 2016, and the Rodriguez rolled in a few weeks later. I forget now why Rachael got hers, but mine was either a reward or a consolation prize for surviving until age seventy, depending on how you view it. Before that we toured on Cannondales for many years, but we both prefer our new bikes to those. 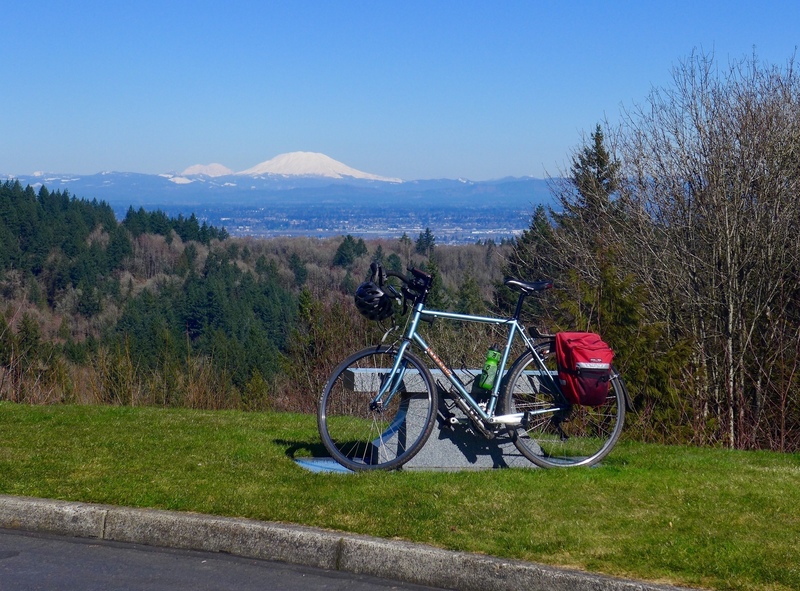 In fact, I dearly love my Rodriguez - it’s the best bike I’ve ever owned, and I’d always ride it if the Friday’s weren’t so convenient and practical for overseas travel. Did you mean surviving until the the age of 50 (in 1996)? The Western Flyer is the ride on all my tours for the last 11 years. The Flyer started life as a mid/upper level Bianchi aluminum CX bike is looking vintage (technology marches on). The frame, fork and seat post are all that remain of the bike as it left the showroom floor. No thru-axles, disk brakes or wide range 2 x 11 (12-13-14?) drive-train. Nonetheless its 3x9 system and new Shimano canti brakes seem to do everything I require.